This article is about the race course from Mario Kart 8. For other race tracks with similar names, see Bowser's Castle (race course). For other uses of Bowser's Castle, see Bowser's Castle (disambiguation). Bowser's Castle is the penultimate course of the Special Cup in Mario Kart 8 and Mario Kart 8 Deluxe. This incarnation is heavily based off the World 8 castle levels from recent Mario platformers, particularly those seen in Super Mario 3D Land, New Super Mario Bros. 2, and Super Mario 3D World. It also contains more obstacles, such as Bowser Statues that shoot lasers (similar to Super Mario Bros. 3), swinging spiked balls, large rolling boulders, etc. In this incarnation of Bowser's Castle, several notable objects are placed inside and outside the castle. One of the notable features is the giant, fiery moving statue in a shape of Bowser himself that constantly punches the forked road to creates ripples on the track. Several minions of Bowser, such as Hammer Bros., Fire Bros., Boomerang Bros. and Dry Bones, are seen patrolling inside the castle, sometimes cheering for the drivers, while a number of Bowser's Airships, taking their design from the Super Mario Galaxy franchise, are seen floating around its exterior. Like in many other Bowser's Castles, Lava Geysers sometimes gush out of the lava pits, damaging other drivers that pass the place where these hazards are nearby. The castle seems larger than most of its previous incarnations and has a more uplifting theme for its music. This course appears to themed after a steel foundry, particularly the inside of the castle and the lava that merely resembles a hot molten iron. The course starts in the entrance of the castle. As soon as the drivers enter the castle, they see the miniature of Bowser pointing the right way, along with several Bowser Statues that shoot lasers at the drivers. After numerous turns, drivers enter the road with anti-gravity sections. Along the way lies the ramps that the drivers can perform Tricks on, but with extreme caution, as there lies the sets of Fire Bars and a flail. After these sections lies the U-turn that leads to the forked way where the large Bowser Monument is. Two roads eventually merge into one and they will have spiraling section of the road. Lava Geysers gush out from the lava pit and hit drivers that pass through these hazards. At the end of the road lies the gliding pad that leads outside the castle. There is another U-turn, where incoming boulders launched from one of the castle's cannons will attempt to knock over any racers. After these turns lies the finish line. Players can use a Mushroom to boost through the black grass before the finish line. The Staff Ghost for this track is Bowser on the Badwagon with a time of 2:23.872 (2:21.980 in Mario Kart 8 Deluxe's 150cc mode) to beat, while the 200cc Staff Ghost in Mario Kart 8 Deluxe is Dry Bowser on the Flame Rider with a time of 1:40.953. This is the only nitro Bowser's Castle course that does not feature any Thwomps. It is also the first nitro Bowser's Castle course since Mario Kart: Double Dash!! 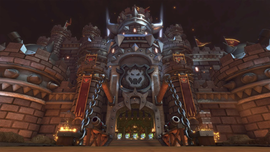 to not have a giant stone version of Bowser's mouth as the castle entrance, instead having a giant shield above the drawbridge with Bowser's emblem on it. During the countdown to the race, the castle's portcullis is seen being raised. This is one of the five courses (the others being Excitebike Arena, Twisted Mansion, Mount Wario, and Electrodrome) to have an opening animation during the countdown. This is the only Bowser's Castle that has a giant Bowser statue that does not breathe fire. Instead, it just punches the two paths of the main road. This page was last edited on February 9, 2019, at 20:24.